At this point it is important to distinguish between a problem and a symptom. A symptom, for example, could be a split in a seam. 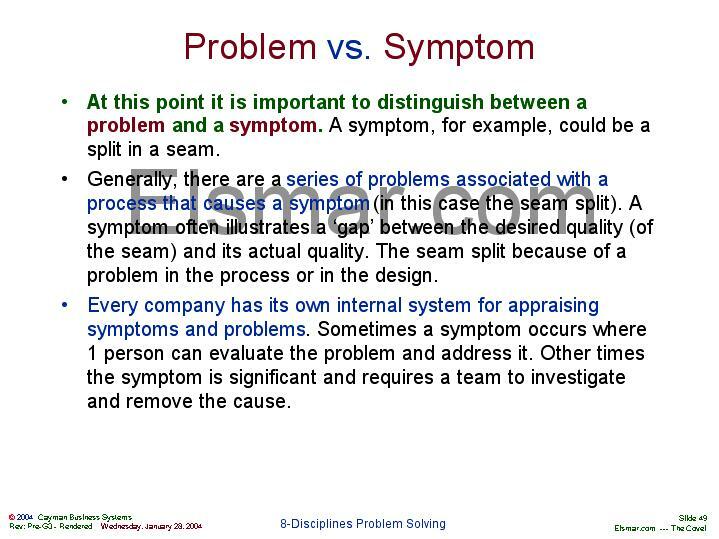 Generally, there are a series of problems associated with a process that causes a symptom (in this case the seam split). A symptom often illustrates a �gap� between the desired quality (of the seam) and its actual quality. The seam split because of a problem in the process or in the design. Every company has its own internal system for appraising symptoms and problems. Sometimes a symptom occurs where 1 person can evaluate the problem and address it. Other times the symptom is significant and requires a team to investigate and remove the cause.